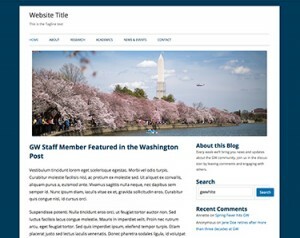 GW Blogs currently offers several theme options for official and unofficial versions. Official Blog themes will contain the GW logo in the footer, while Unofficial Blog themes will contain a general disclaimer. All themes are available in color palettes within GW's brand family. Administrators for a website or blog have the ability to switch between themes and color palettes at any time. Official GW Blogs will include the GW logo and may include and other GW brand elements, provided that they are presented in compliance with GW's Identity Standards & Guidelines. 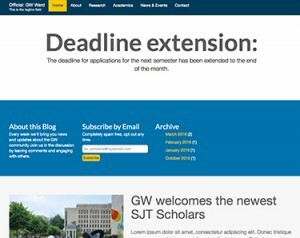 Unofficial GW Blogs should NOT include the GW logo, as these websites are not representative of official university business. Should you have any questions about what brand elements are appropriate for your GW Blogs website, email visualidentity@gwu.edu. Tiny Framework offers a traditional layout and is best suited for simple blogs or websites with minimal visuals. For instance, a class or research project, a newsletter or a conference event, or a personal blog website. Ward offers a modern layout, with a minimalist flat design that is best suited for a traditional blog or website with or without visuals. For instance, a newsletter, a departmental blog or a personal blog website. 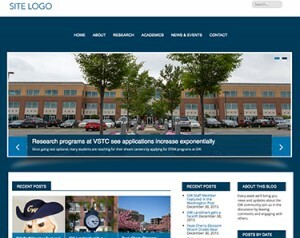 White offers an image-focused design that is best suited for blogs or simple websites with high-resolution imagery. For instance, a conference or event, an art or media-focused project, or a personal blog website. Extend your site's functionality by enabling Plugins on your GW Blogs website. Once enabled, Plugins - and other functions - can be added to your site's sidebar(s) and/or footer via Widgets. All GW Blogs websites, whether official or unofficial, have access to the same plugins and widgets. These may be enabled or disabled by users with Administrator access to the site.